It is increasingly hard to remember a time before the Internet. In fish keeping circles, it's equally hard to recall a time before l-numbers. You have to be a certain age. That is also an indication that both are much more than a passing fad. The big thing for me about the internet is we figured out how everyone could join in. Again in my view, l-numbers is that we figured out how to breed them. They all have their "secret sauce&qout; but none are considered impossible these days. That's an amazing achievement, and one we've made since modem dialup tones filled the evening air. I appreciate some readers will not have a clue what I am talking about. But imagine having just a couple of species of whiptail, some Oto, a few Hypostomus and Ancistrus as pretty much all we had in Pleco land. Although many of these had been bred, this was mostly because they were hardy animals and also because most we not as needy of water current or special features like low oh or high temperatures or special caves. Furthermore, when we did get something new or different, who could we discuss it with? The guys at the fish store, if you were lucky and perhaps a local club if they weren't too snooty. It might be in a good book, but we certainly could not readily reach out to the author or indeed those who had collected or shipped this fish. Interaction between fishkeepers was really different in the early nineties and before. My first two l-numbers were offered to me as a king tiger pleco and a spotted pleco – they were very exciting as were nothing like plecos in books of the time. L-numbers had yet to catch on in the English speaking world but these fish were L066 and L075 respectively. They cost a lot more than a neon tetra. In fact, we were getting into the realms of fish costing more than the hardware required to keep them, this was new. My third l-number required that I travelled through to Glasgow to buy it. 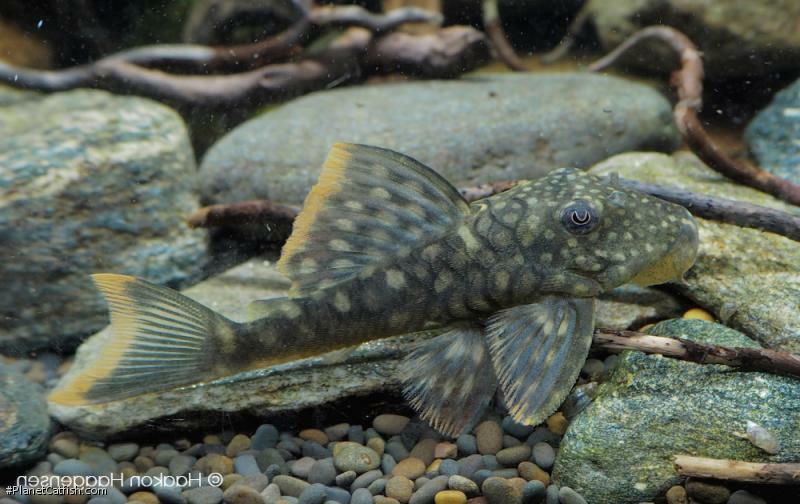 It was one of the first regularly exported non Brazilian species of Pleco. It had a striking flame orange seam to its dorsal fin which even in washed out newly imported fishes stood out as an unusual bit of colour. This L106 proven to be hardy. Being more or less omnivorous it both had a passing interest in algae on the glass but also entertained with bold displays during feeding. Here it was always jostling for whatever sinking food morsel was offered. Once settled, it's colour intensified and the base colour took on a pleasant dark green with lighter but not light spotting. Growth was steady but no more than a couple of centimetres a year. Indeed, this is no tankbuster and so ticks another box in terms of a single specimen being manageable even in relatively small tank. However, keeping a group of four or five perhaps with a group of angelfish is something I've seen accomplished well. Both cichlid and Pleco work well with each other. L106 doesn't need strong current and it is enough of an omnivore to live well on what angelfish eat as long as the odd gut clearing vegetarian option be provided a few times a month. More than a decade after I kept my first one, L106 was described as Hemiancistrus guahiborum, The -orum ending denoting that the species was named for more than one individual. Indeed it was named for the Guahibo, a tribe of people inhabiting parts of southern Venezuela and western Colombia. Some of their number assisted in the collection of specimens in the upper río Ventuari that were used in the description of the species. All together an appealing, community tank friendly species and a good way to earn your l-number spurs.